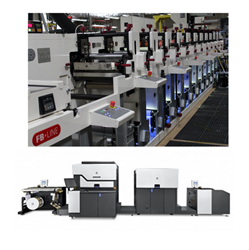 Consolidated Label adds a new 12-color Nilpeter flexographic press and a HP6600 digital press to its production line. Consolidated Label Company, a leading manufacturer of custom labels in the United States, has added two new printing presses to its manufacturing operations to satisfy increases in label demand. Added to the company’s existing production line include a new HP Indigo WS6600 digital press and a Nilpeter flexographic 12-color press taking Consolidated Label’s total number of printing presses to fourteen. Digital printing is a favorable option for projects with multiple label versions because digital makes it easier to print different designs for related products and targeted marketing campaigns. Individuals, start-ups and small businesses gravitate towards digital printing since it’s a cost-effective method for producing smaller label quantities with high quality graphics in a short turnaround time. Projects with variable data (e.g. barcodes and consecutive numbering) are best suited for digital printing since the data can be inputted to the press’ computer system. Along with increasing demand for digital orders, Consolidated Label found the need to expand its flexographic printing capabilities to handle more large scale, complex jobs. The Nilpeter flexographic 12-color press was chosen as it’s the first press at Consolidated Label that can print up to 12 colors. Customers with large label quantities will now have more customization options since the new press can produce a greater range of colors, as well as specialized inks, finishes and more. “With the addition of two presses, we expect to increase our production and be able to deliver a greater variety of label products more quickly and efficiently,” added Carmany.